Although you might not always get the chance to prepare for an edge catch, or have the time to do anything once the edge catches, there are a few things that you can do which can make catching an edge hurt a bit less if you do have time, or sense that you are about to catch an edge. 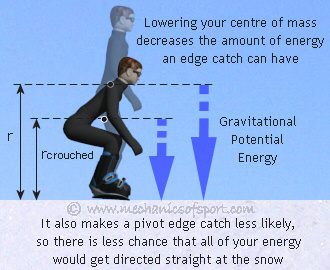 Lowering your centre of mass does 2 things, firstly it decreases your potential energy from gravity, so that any potential impact from an edge catch will have less energy, and secondly the lower your centre of mass is, the lower the maximum speed for a pivot edge catch becomes, making a flying edge catch more likely. A flying edge catch is less painful than a pivot edge with the same amount of energy. This is because a flying edge catch lets you keep some forwards energy, which is dissipated more slowly by sliding across the snow, whereas a pivot edge catch takes all of the energy and directs it straight at the snow for one more powerful impact. This makes the biggest difference in a pivot edge catch. Raising your arms, raises your centre of mass, which decreases the distance to your head from your centre of mass, and reduces the ratio of ground to head / ground to centre of mass. This makes your head hit the snow at a slightly slower speed, and should make the crash hurt a bit less. The energy that is taken away from the head's impact is added to the arms, but this is generally not a problem as arms are pretty resilient. If you do this for a flying edge catch it will also decrease the speed that your head impacts with, although it won't have quite as bigger effect. Spreading the impact force across your body, instead of it being concentrated in certain places, can also stop catching an edge from hurting as much. This makes more of your body hit the snow, but not as hard. Pressure is equal to force divided by area, as soon as the edge catches the amount of force there will be at impact is set, so all we can do then is try to spread that force through the largest area possible, and decrease the pressure of the impact on any point. It is always advised to wear protective clothing when snowboarding, especially a helmet. As well as protecting you from injury, protective clothing can also make crashes hurt a lot less. With all the protective clothing that is available today, there really isn't any excuse not to wear any. There are 2 main instinctive actions that people have to stop crashes from hurting so much, trying to use their arms to soften an impact, and using their neck to protect their head. If you use your arms to try and make the impact hurt less, you should try not to use your hands, but use your forearms instead. 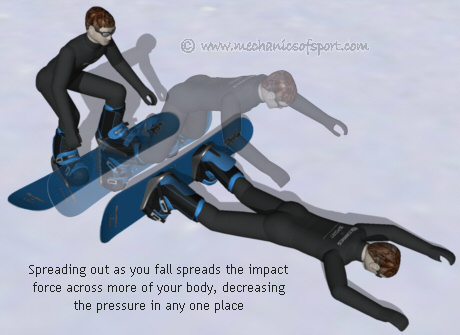 Putting your hands out to soften an impact is the main reason for people to break their wrists while snowboarding. 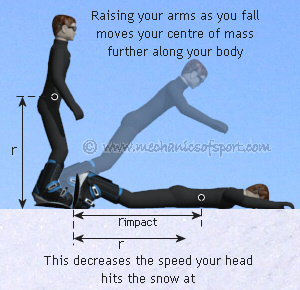 Your forearms are a lot more resilient to injury, and can still give you some good protection from the snow. Bending your neck to soften the impact for your head, helps to protect your head. However you should be aware that after a bad edge catch your neck is going to hurt for several days and possibly even weeks. In protecting your head you often pull all the muscles in your neck, so just make sure you look after your neck afterwards. On to the Edge Catch Mechanics section.